A record partnership by Tamim Iqbal and Shakib Al Hasan has fired Bangladesh to a convincing 48-run victory over West Indies in the first ODI. Mashrafe Bin Mortaza, Bangladesh’s inspirational captain, led the charge with the ball in hand, bagging four wickets for 37 runs from 10 overs. 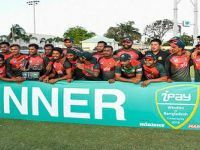 The hard-hitter bagged another record – the slowest century (off 146 balls) by any Bangladeshi batsman – to share the highest second-wicket stand of 207 with Shakib at Providence, Guyana on Sunday. This is also the second highest partnership at any position for Bangladesh. Shakib shares the highest partnership of 224 on the fifth wicket with Mahmudullah against New Zealand last year. Mushfiqur Rahim’s late cameo with a few lusty hits gave the Tigers’ innings the much-needed momentum and took the total to 279. Mashrafe and Mehedi Miraz bowled economically at the start after Tamim Iqbal and Shakib Al Hasan had laid the foundation for victory with a 207-run second-wicket stand to ensure a strong 279/4 on the scoreboard. The skipper made the first breakthrough, picking up the wicket of Evin Lewis in the ninth over after some tight overs. Rubel Hossain then removed Shai Hope to give Bangladesh belief. However, Chris Gayle was slowly taking control and it was his run-out that really changed the match. Gayle, following a miscommunication with his partner at the other end, failed to get back to his non-striker’s end as Windies lost their third wicket. Shimron Hetmyer stuck around to score a 78-ball 52 but Mustafizur Rahman got in on the act with a trademark cutter to remove him in the 36th over. Next ball he found the edge of Powell’s bat to leave West Indies in dire straits. Mashrafe then came back to the attack to grab three more wickets in his last three overs. Only a 58-run tenth-wicket partnership between Devendra Bishoo and Alzarri Joseph brought the margin of defeat under 50 runs for the Windies. # Earlier, Mashrafe won the toss and decided to bat first on a dry pitch. The hosts played both their spinners – Bishoo and Nurse – dropping Kieran Powell and Keemo Paul, hoping to get the turn and bounce on the wicket. The Tigers picked Anamul Haque ahead of Liton Das, but the opener proved the decision wrong when he was caught in the second slip after falling to Jason Holder for a duck. Tamim looked steady as Shakib held the other end. The opener remained unbeaten on 130 before hitting two sixes with Mushfiqur (30 off 11) at the other end. Their partnership reached 50 off 19 deliveries before Mushfiqur was caught by Bishoo at the fine leg in the fifth delivery of the last over of the innings by Andre Russell. Shakib was only three runs shy of his century when he tried to sweep Bishoo but top-edged and was caught by Hetmyer. After Shakib, Bishoo drew Sabbir Rahman (3) forward to have him stumped by Hope. Earlier, a 207-run partnership between Tamim Iqbal and Shakib Al Hasan saw Bangladesh consolidate after an early loss of the wicket to reach 279/4 in the first ODI against West Indies at Guyana. Tamim Iqbal struck his 10th ODI hundred – a tremendous 130 off 160 balls, an innings that contained 10 fours and three sixes. Tamim’s unbeaten 130 was also the highest individual score by any batsman at this ground. Shakib was on the verge of scoring his eighth ODI hundred before he fell to Devendra Bishoo in the 45th over after a 121-ball 97. The left-handed all-rounder struck six fours during his innings. The duo paced their innings well as they looked to build a partnership. Runs were slow to come early on with just 31 in the first 10. The duo slowly accelerated the run-rate. After 20 overs run-rate was 3.85 but at the 40-over mark it went up to 4.67. 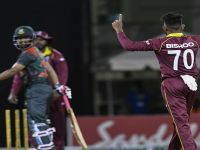 The partnership was not only Tigers’ highest ODI partnership for the second wicket against the West Indies, it was also the highest second-wicket stand in ODIs between Bangladesh and West Indies. Shakib-Tamim’s 207-run stand also became the highest partnership for any wicket at the Providence Stadium ground, beating Sanath Jayasuriya and Mahela Jaywardena’s 183-run third-wicket stand against West Indies back in 2007. After Shakib’s fall, Sabbir Rahman failed to impress, Bishoo removing him for just 3. A cameo 11-ball 30 from Mushfiqur Rahim ensured that Bangladesh reached a handsome total in the end. Ten boundaries had come from the last 14 deliveries of the innings as Bangladesh batsmen ensured that they took advantage of having wickets in hand. The last two overs produced 43 runs as Mushfiqur and Tamim got into the act, picking up 22 and 21 runs off the 49th and 50th over respectively. Mahmudullah Riyad lapped the last delivery of the innings for four as Tigers finished on a high to set West Indies a target of 280. Earlier, Liton Das was a surprise exclusion from the side after he came back in amongst the runs in the warm-up match against UWI Chancellor’s XI at Sabina Park on Thursday. The good news for Bangladesh was the return of pacer Mustafizur Rahman following a foot injury. Mosaddek Hossain, who did not feature for the Tigers since the Champions Trophy has been included while Anamul Haque Bijoy also made a return after he played in the home tri-series against Sri Lanka and Zimbabwe last year. The next match of the series will be played in Guyana on Wednesday and the last one in Saint Kitts on July 28. In the disastrous Test series for the Tigers, the West Indies won the first match by an innings and 219 runs and the second Test by 119 runs.